New space would add screening rooms, lobby to film center; extension would fill in vacant lot on Cornelia Street. On October 13, 2015, the Landmarks Preservation Commission held a hearing on a proposed extension of the IFC Film Center that would face 14 Cornelia Street in the Greenwich Village Historic District Extension II. The Film Center, at 323 Sixth Avenue, adjoins and owns the lot at the rear, currently vacant, on Cornelia Street. The lot to be developed lies partially within an R6 residential zoning district, and will require a variance from the Board of Standards and Appeals for the planned commercial use. Attorney for the applicant Paul Selver, of Kramer Levin, stated that the design approach was driven by consideration of the historic district. IFC Center Vice President John Vanco testified that the Center required more space and amenities to compete with other similar businesses in the City, like the Angelika Theater and Sunshine Cinema. The addition would allow the Center to add more theaters, as well as a ground-floor lobby where patrons could congregate before screenings. The current lobby is too small for the Center’s needs, leading to patrons loitering on the street before screenings. Vanco said the proposal was intended as an “architecturally rhyming contribution” to the Cornelia streetscape. Vanco noted that the Center’s building was oldest continuously-operating movie theater in the City, housing the Waverly Theater before IFC occupied the space in 2005. The building was originally constructed as a church in 1853, but most of the original facade details have been lost. The building’s ground floor would be faced with a glass storefront, meant to correspond with the block’s several restaurants and shops created in the ground floors of residential buildings. The fritted glass would allow pedestrians to see “movement and activity” within the lobby without being entirely transparent. There will not be an entrance to the Center on Cornelia Street, only an emergency exit door. Lighting on the street would be minimal according Halsband, just enough so that the street did not feel unsafe. Sarah Bean Appman, speaking for the Greenwich Village Society for Historic Preservation, criticized the design for not adequately relating to the “intimate” character of Cornelia Street, particularly identifying the aesthetic impact of the upper stories with their angled panels for disapproval. Cornelia Street resident Leif Arntzen said the proposal was unsuitable for the residential block. 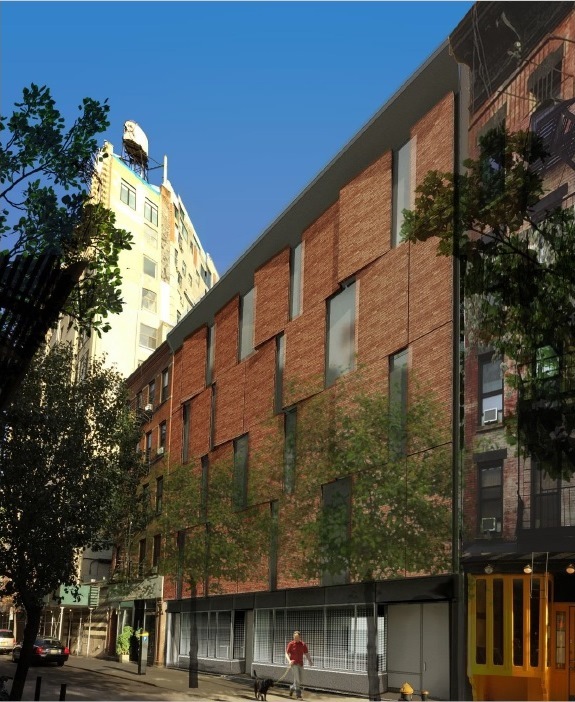 Chair Meenakshi Srinivasan stated that Manhattan Community Board 2 had issued a statement supportive of the project’s massing, but recommending rejection of the facade design. Chair Srinivasan called the IFC Center one of the best things to happen to Sixth Avenue in recent years, and Cornelia a “special street.” Srinivasan praised the proposal’s massing and said the infilling of the vacant lots was positive for the district. She found the proposal’s upper stories to appropriately refer to the block’s historic architecture, but questioned the approach to the ground floor. 14-16 Cornelia Street, Manhattan (17-5381) (Oct. 13, 2015) (Architects: Kliment Halsband Architects). The IFC does not own the lots on Cornelia Street, nor does it own the land where it sits. The IFC is the tenant and the owner is Friedland Properties, aka billionaire Larry Friedland. The IFC is not a cultural institution It is a publicly traded company under the control of AMC Networks along with Cablevision and Madison Square Garden, aka Charles and James Dolan. If the two Cornelia Street lots are re-zoned, Friedland and the Dolans will have the right to inject commercial concerns into historically residential Cornelia Street. I smell horse – Trojan horse.